Last week I had two Irish friends come visit. They both have lived and worked in Belgium for over three years and their observations about Edmonton and it’s locals was interesting to me as a native Edmontonian and a “naturalized European” who quickly readapted to her home environment. 1. Edmonton has a lot of independent dental offices. Have a look around Edmonton core and it’s true, dentists are abundant. 2. The parking metres along the streets look the ones straight out of a movie. In Ireland and Belgium, there aren’t any parking meters, but instead a payment box where you get a ticket and place it on your dashboard. 3. Edmontonians have a lot of tattoos. In Belgium tattoos are few and far between and usually they tend to be descrete. It’s not often you see people will full sleeves. 4. There is a crazy amount of mosquitos, even in the city. The girls were covered in swollen red bumps and the presence of a mosquito would often result in total abandonment of conversation until the sucker was dead. 5. One thing that she said that amused me was “everything just works“. The presence of so many rules and citizens who follow them results in a rather orderly society where service is fast and smooth and mistakes are rarely made. Even the transit ran exactly on time during their visit. In Brussels, the service is deplorable so this observation made perfect sense. 6. Tim Horton’s is cheap. Compared to your other coffee chains, Tim Horton’s was a cheap acceptable breakfast option for my Irish friends. When I asked what they thought of it, there was a moment of silence and they said it was alright. My response was, “I know, it’s the McDonald’s for breakfast food.” They immediately agreed. Canadian’s give the impression that Tim Horton’s is a prized institution, but it should be duly noted that Tim Horton’s will not impress European, if not any, visitors to Canada. 7. They also noticed that people are very friendly. People smile all the time, they smile when passing each other in the street, in line at the shop, and in the service industry. My friend enjoyed a five minute conversation with the ticket sales girl and said that the brief human interaction is a nice change from only exchanging the necessary words with service personnel in Brussels. 8. She noticed that instead of saying “eh?” as much as we are stereotyped that Western Canadians say “yeah” instead of “yes” or “you’re welcome”. 9. When she mentioned it, I also noticed the lack of coasters in restaurants. You often find coasters in more causal pub settings in Edmonton, but it’s true that many restaurants let you leave a mosaic of rings on the table from your glass. 10. Canadians, me included, have an aversion to with word “toilet” which is the norm in many European countries and we use the word “washroom” instead. In Ireland, they sometimes say bathroom and Canada as well, but now that she’s mentioned it, most toilets are in fact labelled “Washrooms”. 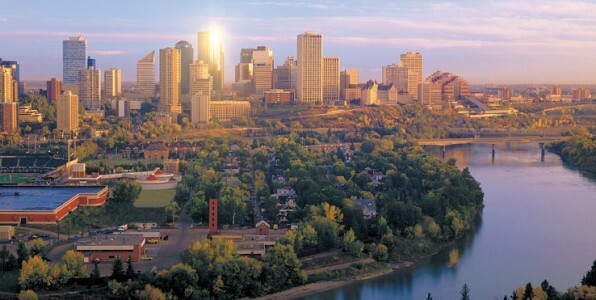 So there are 10 facts about Edmonton that you may not have observed yourself. It was great to have European visitors in “little old Edmonton”. It was the their last stop after visiting Vancouver, Whistler, the Rockies, and Calgary. They were entertained and noticed all the good things Edmonton has to offer it’s residents.